Bandipur National Park is in Karnataka state in India. Famous for its tiger and elephant reserve and protected sandalwood trees, this 890 sq km park is one of India's most delightful wildlife sancturies. The tiger reserve was formed later. Prior to the decision, it was a small 80sq km region hunting ground for the Maharaja. This Bandipur National Park was born in 1931 when it occupied 800 sq. km of the total land of the Bandipur Reserve Forest. Following this, in 1973, the Bandipur Tiger Reserve was formed that has taken a great care of significant, but consistent increase in the number of tigers. In the historic days, the Maharajas (kings) of the nearby Mysore city regarded the Bandipur forests as a private game reserve. Since its inception, as it is situated under the canopy of the Western Ghats, the Bandipur National Park is undoubtedly among the superb habitats for the Asian Elephant and Gaurs. Various plants and also Sandalwood trees are common here. Bandipur is under project tiger. Elephants, Tigers, Chittal(spotted deer). 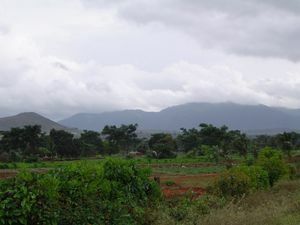 The nearest town is Gundlupet or Gundlupete, 31 km. The nearest city is Mysore, 89 km. It is easy to drive the hill temple. It is around 230 km from Bangalore and a 5 hour journey. Since the weather conditions are extreme, it is advised to keep the car in good shape, especially headlights, wipers and tyre pressure. The park does not allow private vehicles inside the national park. Only the park reserved vehicles are permitted to go inside with a guard who is also the driver. The surrounding high end resorts have a tie up with forest department and allow for gypsy rides. Every safari is only for strict 45 minutes. The bus can accommodate 20 people in it and is jam packed on any weekend. The view from top of this hill is truly breath-taking. It is one of the highest peaks (1454 meters above sea level) in the Bandipur National Park, Karnataka, India. It is also called Himada Gopalswamy Betta, as it is covered in mist (hima means mist in Kannada), for most of the months. (Betta means hill in Kannada). Another attraction at this peak is the fabled perpetual wind, that greets anyone who cares to climb it. Herds of wild elephants are seen regularly near this peak. A lake, a few hundred feet below the peak serves as the local watering hole for the other wildlife. The nearest town is Gundulpet, 20 km. There are no buses to Gopalswamy betta, so it would be prudent to take either a taxi, or ride a motorbike. Take the NH-212 towards Gundulpet from Mysore. Just outside of Gundulpet there is a fork in the road. One towards Sultan Bateri, Waynad (NH-212 continued) and the other towards Bandipur (NH-66). Take the fork towards Bandipur. As you proceed towards Bandipur, take a right turn at Hangala village. (There should be a big Karnataka Tourism board abutting the road). From this point, the hill top should be 15 km. 4 km further, there is a forest department check post at the base of the hill. It is a 10 km winding, steep road, with a few hairpin bends that take you to the hill top. Camping is possible, with the permission of the Range officer, at the Bandipur National Park. A travelers' bungalow is also available, but it has no running water. Again, the permission of the Range Officer is required. The national park organizes 45-minute bus safari into the forest for a minimal fare of Rs. 135/- only for Indians. Foreigners have to shed a few extra bucks. There is also open-jeep safari for Rs. 2200/-. The safari, however, doesn't guarantee that tourists will get to see tiger, as it is a matter of chance. Safari is available only during 6:30 am to 9:30 and after 3:30 pm time slots. Kids love the elephant rides organized by the forest department for Rs. 120/-. The ride is for just 20 mins and it is not a safari. Trekking in the jungle is illegal and has been banned. Avoid visiting on weekends ie; Saturday and Sunday as it will be filled with local tourists. Dormitories and cottages are provided by government. Cottage booking requires prior permission by authorities in Mysore. Jungle lodges also provides tenting facilities for accommodation. Campfire is organized by Jungle lodges. You can also pitch your own tents with prior permission outside the forest area. Monkeys do cause some menace here if one is not careful. One has to make sure they don't leave their cottage doors and windows open when you go out. If you are driving by and see some wildlife, do not lower your windshield when you stop your car, you'll have attracted some fearless monkeys which will enter your vehicle and not leave until it finds something to eat. Try not to feed the animals. Ooty is a famous hill station in southern India. It is an ideal place for honeymoon couples.